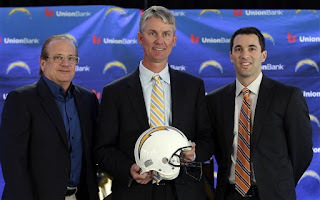 Did the Chargers make a good move in hiring Mike McCoy? One of the hotter coaching candidates is off the market as Broncos offensive coordinator Mike McCoy was hired today by an AFC West rival, the Chargers. Is this a good hiring and can McCoy be the guy to get Philip Rivers back on track? It is clear why the forty-year old McCoy was a top candidate for many jobs. In his first couple of years in Denver, he played a role in Kyle Orton putting up big numbers in the passing game, although head coach Josh McDaniels was a driving force both years, of course. But McCoy has really shown his talents as a coordinator these past two seasons as he tailored his offense in 2011 to suit the traits of Tim Tebow (remember him?) and incorporated more read-option and shotgun elements to fit the unusual talents of his quarterback en route to an upset playoff victory against the Pittsburgh Steelers. And this year, with Peyton Manning in his first year in town, he called the plays for an offense that ended up fourth in the league in total offense. Not to mention that this hiring weakens a divisional rival, so it is easy to see why the Chargers made this hire. The key will be for McCoy to improve an offense that has disappointed amid a loss of talent the past couple of years and the focal point of McCoy's emphasis will be with Rivers. While Rivers's numbers were not awful, anybody who watched him play this past year saw a quarterback that regressed a fair amount as he clearly missed Vincent Jackson, who signed with Tampa Bay last offseason, more than many thought he would. Now while the offensive line needs a lot of work and running back Ryan Mathews can never seem to stay healthy, it is not all Rivers's fault for the team's decline but poor decision-making put the team into too many binds in 2012 that the club struggled to dig out of. And the thirty-one year old has not won a playoff game since 2008, further increasing the pressure on Rivers as he is in the last years of his prime. If McCoy can bring back Rivers to where he was only a couple of seasons ago, rebuild a porous offensive line and maintain the good defense, he should be able to find success.